Ever wanted to split a comp? Want to bend an image around a corner? Don't let the static comps stop you. Use 3D Splitter! 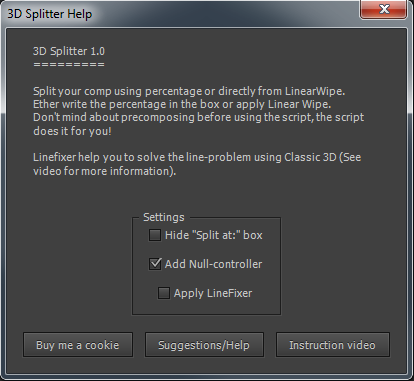 3D Splitter splits the comp exactly where you need with a small and easy UI for your help. Split your comp using percentage or directly from LinearWipe. Don't mind about precomposing before using the script, the script does it for you! Quick buttons to add LinearWipe and Grids to make your workflow faster. Settings to suit you and your workflow. Use it as a floating script or dockable UI. All new split-precomps ends up in a subfolder in the same folder as the comp you are working in, to make everything look less messy. 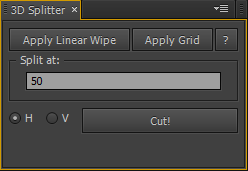 The script will read the information from the Linear Wipe instead of the "Split at:"-box if created from the script. You can make the UI smaller by enable "Hide "Split at:" box" in the settings. If you have "Add controllerNull" selected in the settings the script will create a null and parrent all the splits to it. The null will be created ones and will be placed where the anchorpoint were on the mainComp. (Works with unlimited numbers of new splits). If "Apply Linefixer" is on, the split-precomps will be applied with the mode "Aplha Add" to remove the line-error that AE creates. All the settings will always be saved for the next usage, have it your way! Why not give it some minutes and see for yourself. 1.0.2 - Better precomposing. Original AE-precomposing instead of scripted. 1.0.1 - Small fixes, nothing to special.